In ancient times, you generally had to make everything you needed. Not to mention what you wanted! In clothing, you would have had to raise the animal, take its coat, tan or wash, spin, weave the fabric, and sew your clothing and anything else like bedding. For the kitchen, you had to make everything too, either by black smithing or carving wood. Anything that is made out of wood that was used in the kitchen, including cutlery, plates, bowls, even cups and mugs, were called treenware. Pushkin State Museum of Fine Arts Cosmetic Spoon Ca. 1550-1069 B.C. One had to eat and drink and keep the mash contained and not running down into the cracks of the table to plop on the ground for the dogs to lap up. 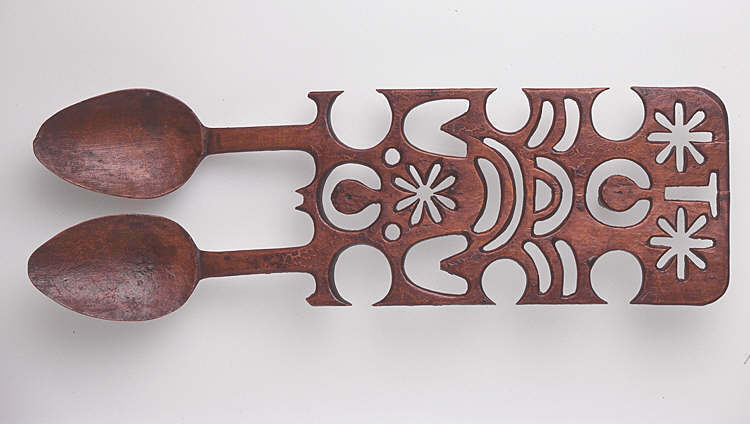 The art of carving spoons out of wood was an ancient necessity. 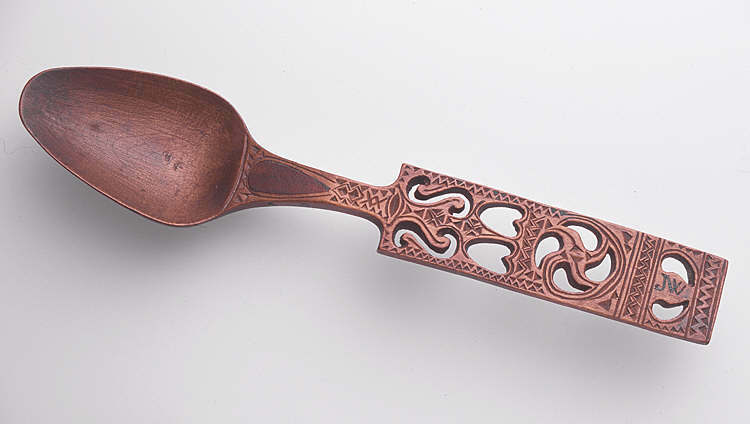 But did you know that spoons were eventually carved for romantic purposes? You read right. Love spoons, or lovespoons, depending on whose article, whose book, whose history you read, have quite the history, beginning roughly in the mid-17th century. The practice itself is probably ancient, and unrecorded, because people weren’t concerned with documenting history like people are today. Therefore, finding a dated love spoon is a special and rare find. 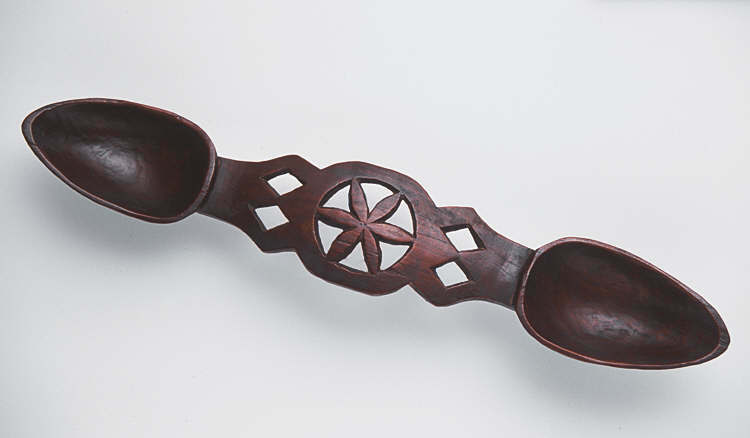 The earliest recorded love spoon, supposedly, was a Germanic spoon in 1664. 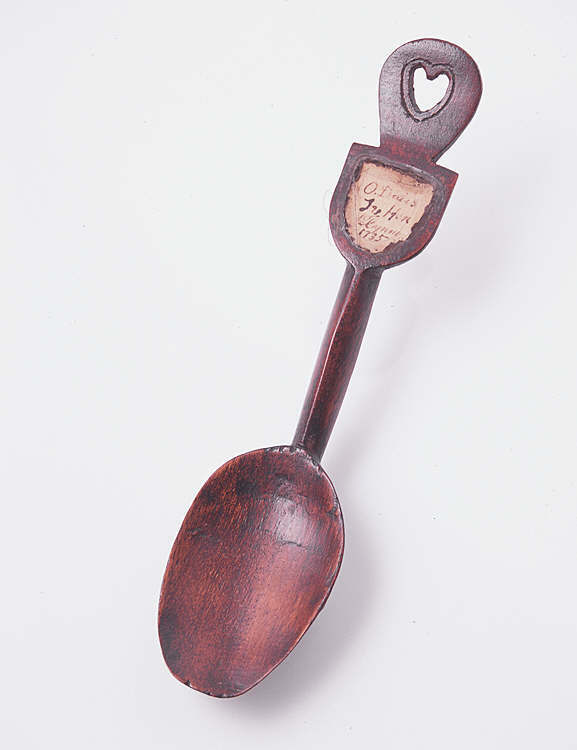 In Wales, their oldest love spoon dates back to 1667. According to David Western, a cabinetmaker turned carver, in his book Fine Art of Carving Lovespoons, the practice of carving love spoons probably existed from Sweden to Hungary. Pretty much everyone agrees that a young man, during the cold winter months, would carve a spoon for his intended. 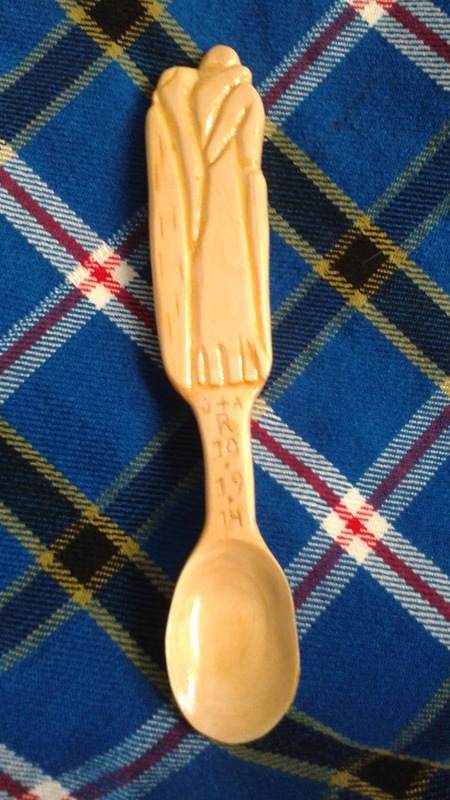 Some would even say that it started as a way to pass time on the ships, a sailor carving a spoon for his intended. Quite frankly, that just drains the blood right out of my veins thinking about trying to carve on a wave-bumped ship. (Have you heard of Scrimshaw?) Both myths are probably true, depending on which part of the world you find yourself in. We know that sailors and ships influenced the designs decorating the spoon handles because of the ships found engraved on some of them. 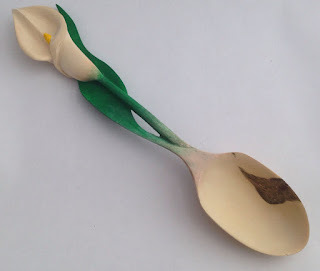 Although there is no proof that the acceptance of a spoon meant engagement, the story that got me hooked on love spoons was by a carver who told me that, “Guy likes a girl. He carves her a spoon. He goes to her house, puts the spoon on his shoulder and knocks on the door. When she answers, if she takes the spoon off his shoulder and puts it on hers, shuts the door, he’s got a fiancé.” Okay, so there’s no proof, but it sure is romantic! 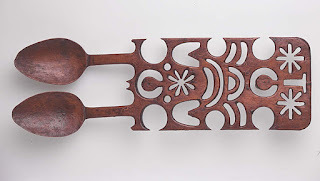 There have even been love spoons found in Egypt, Africa and North America! But as deeply as you can research, it is still incredibly difficult to ascertain a specific start date or origin. 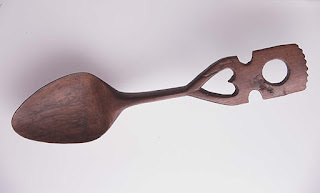 The history of love spoons almost seems to have just started, by themselves, with love. 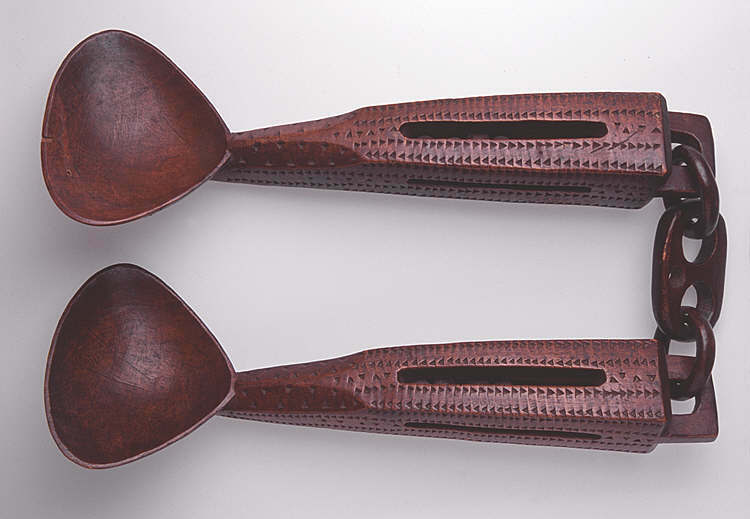 The spoons would have originally been of simple design with little or no decoration, being a more practical show of usefulness and the ability to provide. They were probably used as a ladle for the stews that were common in the 17th centuries. Then over time, designs were added to the flat part of the ladle, it being long and level and a good place to put them. 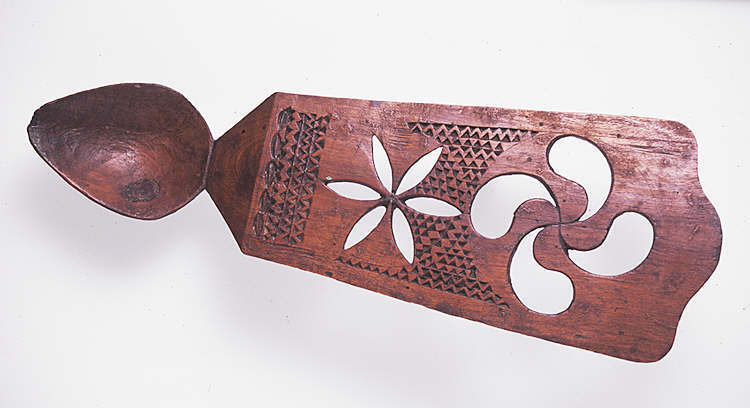 The more intricate the design represented more skill to provide for a wife and family. Some would have two spoons attached by chains. Some would have multiple spoons. Symbolism became prevalent, with specific designs for specif meanings. 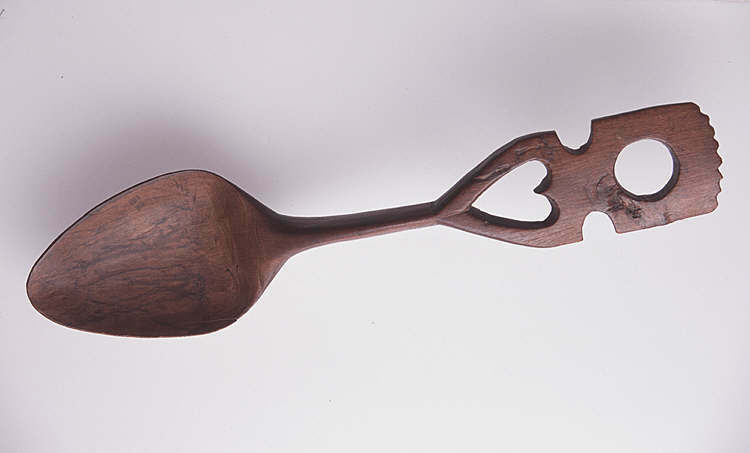 The heart is the universal symbol of love and is frequently seen on Welsh love spoons. It is a sign of passion and strong emotion - surely signifying the carver's depth of feeling for his beloved. 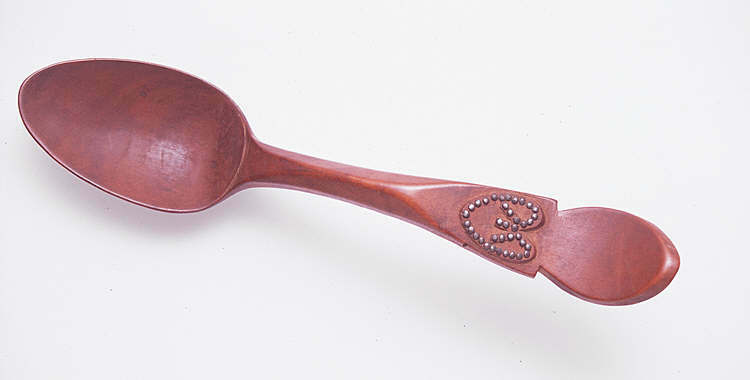 A love spoon showing twin hearts might well indicate a mutual love between sender and recipient. 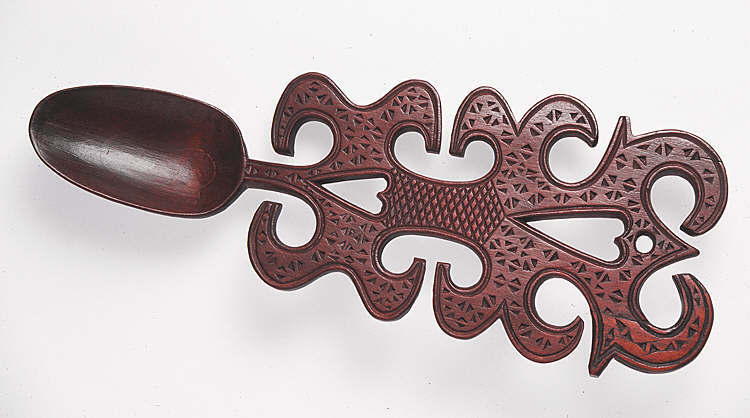 Often visible on historic Welsh love spoons, this shape is said to represent the soul and deep affection. Balls carved within cages are commonly thought to represent the number of children desired by the carver, but could equally be a sign of a man held captive by his love for the woman. Generally considered to indicate loyalty and faithfulness, chain links might also symbolize a couple bound together in their love and loyalty. Diamonds are believed to represent a wish for prosperity and good fortune and a promise to provide well for a loved one. Keys and keyholes: In addition to the house images that sometimes appear on Welsh love spoons to represent domestic contentment, key and keyhole carvings are also used frequently, perhaps symbolizing security or, more romantically, the key to one's heart. 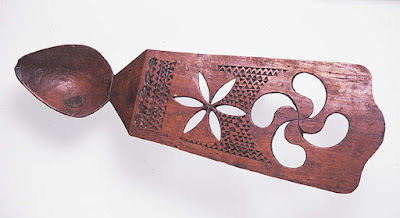 Wheel symbols often featured in Welsh love spoons are said to represent a vow by the carver to work hard and to guide a loved one through life. Occasionally, love spoons are carved with two or more bowls, possibly to indicate the union of the souls when joined together, or perhaps the number of children desired. In more modern symbols, you have horseshoes, bells, paddock and crossed keys, and more Celtic knot work. There is so much more! 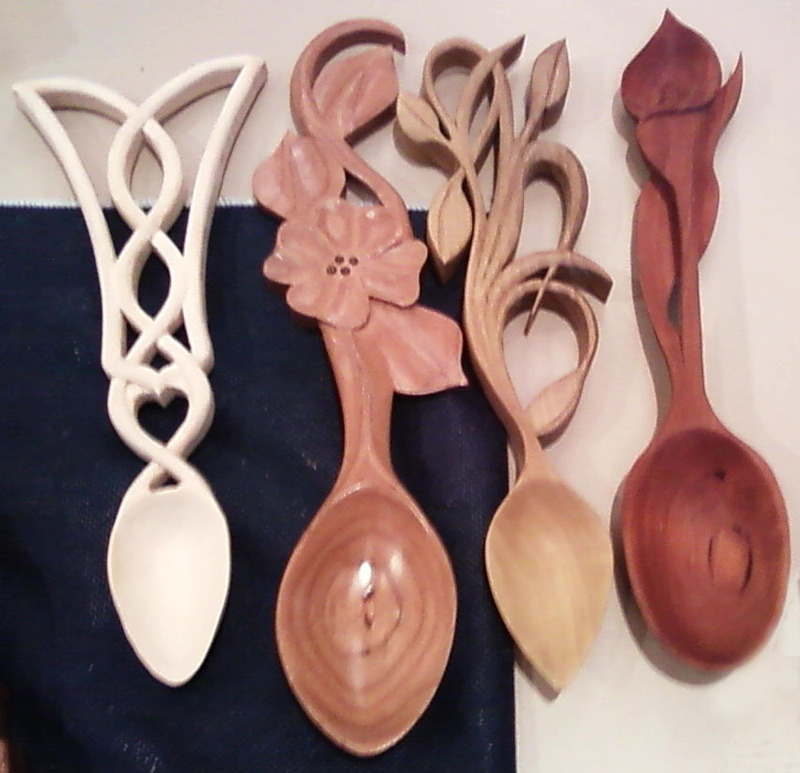 Love spoon designs can be as intricate and delicate, or as simple as a figurine. Today, love spoons are given as gifts for Valentines Day, weddings, anniversaries, birthdays, new babies, even as wedding favors. They can be as original or traditional as desired. 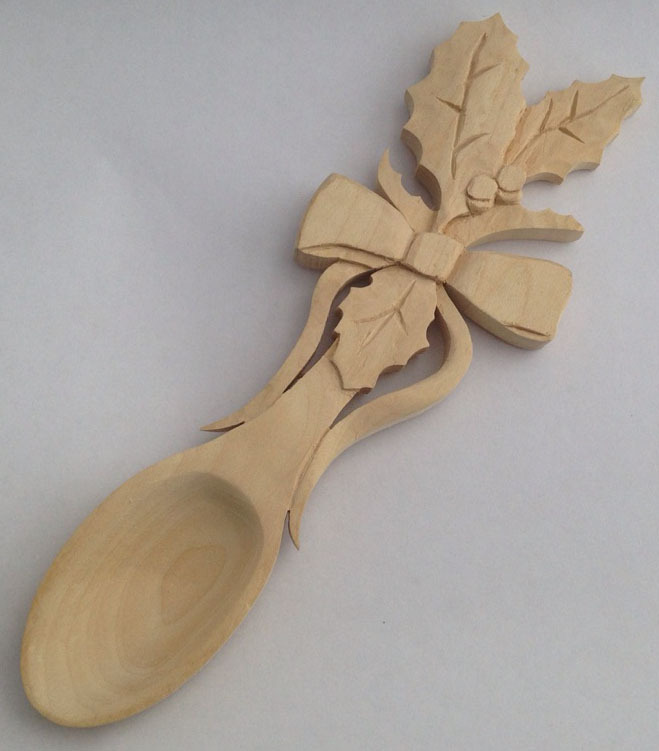 Visit a local woodcarving show and see what you can find! Maybe even try designing one yourself with the help of a skilled carver. This was one of the most odd posts I've read so far....I never heard of Lovespoons before. Spoons? Really? It's odd, yet cool...you did a great job on your spoons. Thanks for sharing. 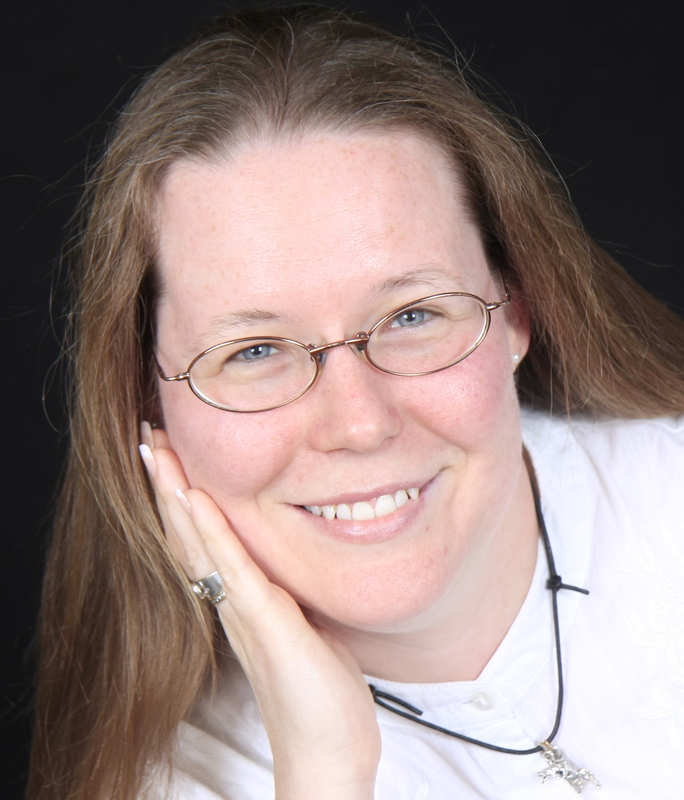 I always learn something new on this blog and that's why I love it! I had never heard of love spoons before until six years ago. It's such a beautiful art and am so glad it is having a bit of a revival today. I think it really speaks to the hopeless romantic in me :-D Thank you very much! Fascinating! I don't know a lot about this period of history, so this was a very educational post. Thanks. That's one neat thing about love spoons. They have literally spanned over centuries! What's the common phrase? Love conquers all? Hehe.Thank you so much reading! Unique post with a lot of history that isn't known. Love spoons would be a treasure and made especially for the intended one. Thank you for sharing. They certainly are, both seeped in mystery and tradition and love, Marilyn! Thank you so much! I love it! Pardon the pun. I also never heard of Love Spoons. Now I want to make my own so I have to go hunting for someone to show me how. I could really use your input on how to do that. Now, look what you have started...lol. Thank you so much for sharing your fascinating knowledge. Wow, Alanna! I've never heard of love spoons. However, as a fellow woodworker, I admire the craftsmanship you put in your work. My Finnish grandfather taught me how to whittle spoons when I was twelve. They were simple wooden kitchen spoons similar to your Heirloom Spoon but with a thicker neck, shallower bowl, and strictly for kitchen use. The older I get, the more I wish I'd saved mine. Very nicely done - the spoons as well as the post. Oh, can we say drool? What an experience and treasured memory! I inherited my great grandfather's whittling pocket knife. My grandmother when she gave it to me told me that he made sure that he kept it was extra sharp and was used only for whittling. "If you use this, you better keep the edge just as sharp." She's been gone three years now and I have yet to use it. And I hear you there. I believe there are lots of things we all kick ourselves later for letting go. Perhaps you can make some more and share? I'd love to see some of your work. Look me up on Facebook and drop me a message! I have never heard about love spoons. This is amazing! Couldn't agree more, Melissa. Thank you so much for reading! Thank you, Kathleen! 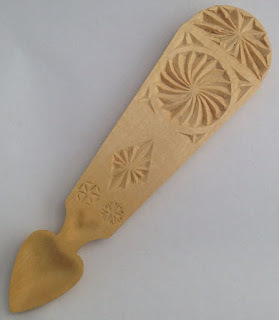 Depending on the the size and design of the spoon, you can have one made in an afternoon for the most part. The smaller details will probably take longer. Then again, it could take you a couple of weeks! Some of the spoons done by today's masters are the size of their torso! They are that huge! Fascinating! Thank you so much for sharing! I love learning about romantic traditions like this! It really is! Thank you so much for reading! This is so fascinating! I've never heard of love spoons. Thanks for the history lesson! So glad you enjoyed it! Thank you so much! This was definitely a learning post for me! I have never heard of love spoons and I appreciate that you shared this with us!